One of the best lamb cuts is the boned middle loin of lamb, sometimes known as rib-eye or backstrap. This choice piece of meat can be sautéed, poached or cut into medallions and grilled, but best of all is this method of opening the piece out flat and then grilling it very quickly. Have your garnishes ready before you start cooking: maybe washed and dried salad leaves, vinaigrette or other dressing, warm boiled potatoes, just-cooked green beans, warm cooked cannellini beans, roasted tomatoes, parsnip chips, chopped sun-dried tomatoes, and so on. Ensure that meat is totally free of fat and membrane. Using a sharp knife, and holding the blade parallel with the bench, slice through each piece of meat, but not quite through. Open out. Pound each piece of meat a little with the flat of your hand, then slip it into a plastic bag and gently and evenly pound it with the flat side of a meat mallet (or a rolling pin) until a little less than 5 mm thick. Paint meat with oil. Preheat a ridged chargrill pan. Slap meat on hot grill, then turn it 45 degrees after 1 minute. After a further minute, turn meat over and repeat on second side. Remove cooked meat to a hot plate and season. Toss salad leaves and arrange on 4 plates. Cut meat into strips and divide between plates. 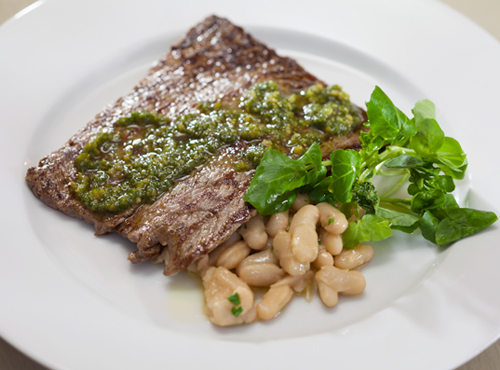 Add pesto or anchovy butter, which will melt deliciously over the lamb, then add other chosen garnishes.